Nowadays, there is a significant demand for natural stone installation and its continue to grow. That is why Action Home Services is now offering natural stone and flagstone installation services. So, what is the flagstone?In comparison to the majority of interlocking bricks, flagstone is a natural stone. In others words, it is the sedimentary stone which has been cut and calibrated. There are different size, shapes, and colours of flagstone. Since it is a natural stone, there is no manufacturer of this stone. However different suppliers may have various types of stones. Pale colours and resistance to weather made these stones popular across Ontario. 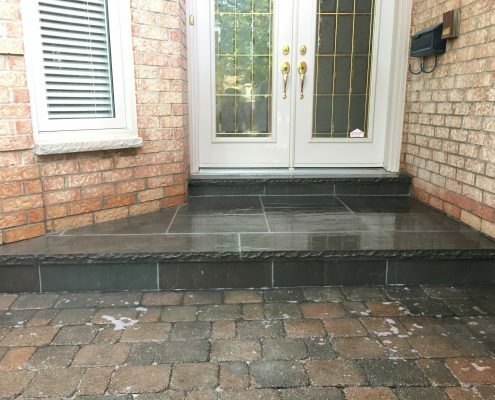 Depending on the specific needs of the customer and other factors, Action Home Services will find the best method of installation of the flagstone. 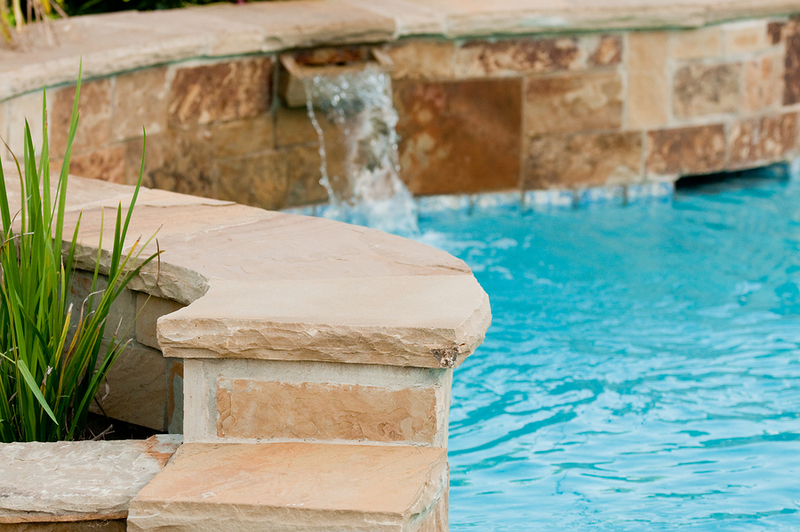 The flagstone or natural stone may be installed on top of the screening or concrete base. In both situations, the sub base has to be prepared in a similar way as preparing the base for the interlocking pavers. The soil has to be excavated by at least 6 inches or more depending on the type of soil. Then hard rock and screening material have to be added. After this, concrete is formed and paved. Once the concrete cures, flagstone could be installed. It is important to add some cement underneath each flagstone to make sure that the flagstone can stick to the concrete. Finally, gaps between flagstone need to be filled with cement or polymeric sand. There are a lot of different shapes and colours of flagstone, however the most popular ones are random flagstone and calibrated & cut flagstones from Banas Stone. Each of these flagstones has its own positive and negative sides. For instance, random flagstone is relatively cheap, and it is sold by weight. Also, it has a variety of different colours which you will not find from other companies. The interesting fact about random flagstone is that it is almost impossible to find two stone of the same colour. On the other hand, calibrated stones are easier to install and have square or rectangle shapes. Besides, you will be able to find two stone of the same or very similar colour, so it is easier to match it to your house colour. Both of these stone looks great, so every homeowner has to choose the flagstone which suits their needs the most. 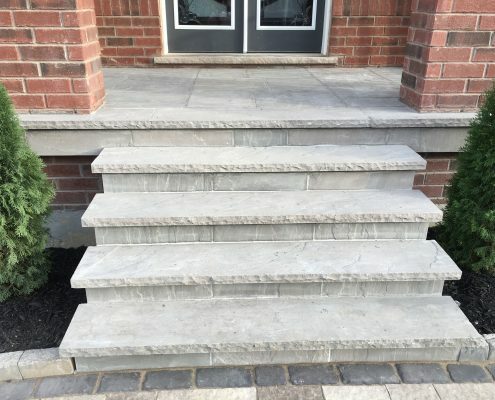 Action Home Services is an experienced and flagstone contractor serving Toronto, Markham, Vaughan, Scarborough, Brampton, Mississauga, Burlington, Oshawa, Richmond Hill, Milton, Oakville, Aurora, Caledon, Pickering, Whitchurch – Stouffville, Ajax, Whitby, New Market.